Greek crisis: Deal now seems likely, optimism abounding. 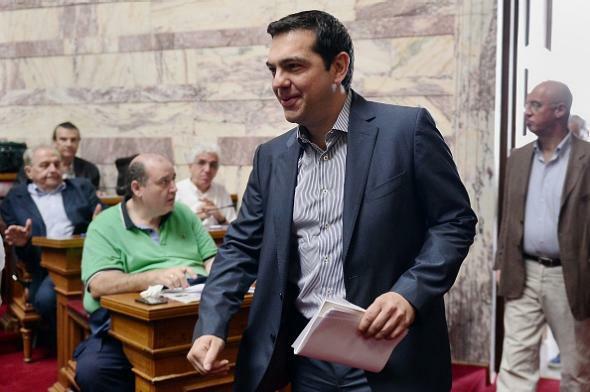 Greek Prime Minister Alexis Tsipras, looking optimistic at a parliamentary meeting Friday in Athens. Optimism rose on Friday over the prospects of an accord between Greece and its international creditors, as the two sides weighed the latest measures from Athens aimed at overhauling its economy and securing its place in the euro currency bloc. Prime Minister Alexis Tsipras’s government on Thursday agreed to meet most of the terms demanded by the creditors with a mix of tax increases and spending cuts, and it requested a three-year, 53.5 billion euro, or $59 billion, bailout as a starting point for talks about possible debt relief.